Donald Trump is expected to arrive in Texas on Tuesday, aiming to show unity in the face of what he called the "terrible tragedy" wrought by storm Harvey's devastating rains. Donald Trump is expected to arrive in Texas on Tuesday, aiming to show unity in the face of what he called the "terrible tragedy" wrought by monster storm Harvey's devastating rains. The US president and his wife Melania are not slated to visit Houston, America's fourth largest city where rescue teams were scrambling to reach hundreds of stranded people as Harvey appeared poised to strike again. They will instead make stops further west, including hard-hit Corpus Christi, for briefings on relief efforts as catastrophic flooding has crippled parts of the massive state's southeast. The medical examiner's office for Harris County, which includes the city of Houston, confirmed six deaths since Sunday "potentially tied to Hurricane Harvey." Three people were previously known to have died as a result of the storm. "We are one American family," Trump said Monday, eager to present himself as a unifying figure in the face of natural disaster -- after leading for seven months a White House plagued by controversy, much of it self-generated. He promised the federal government would be on hand to help Texas along the "long and difficult road to recovery" from the historic storm. "Search and rescue, that's the number-one emphasis, the number-one priority for the rest of the day," he said, recalling that around 100 people had died the last time officials tried to empty the city of more than 6 million. 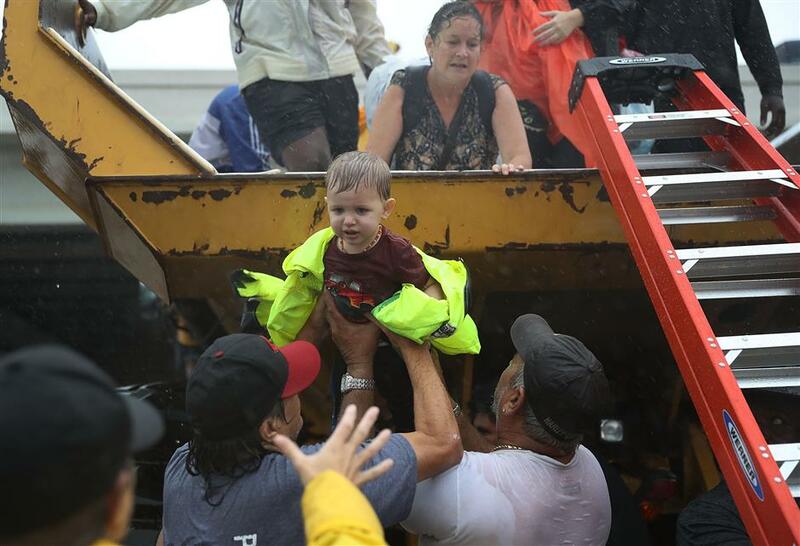 A child is helped off the back of a rescue truck after his family evacuated their home after it was inundated with flooding from Hurricane Harvey on August 28, 2017 in Houston, Texas. Coast Guard commander Vice Admiral Karl Schultz told CNN that he had 18 helicopters in Houston, and weather permitting about 12 in the air at any one time, alongside those of the National Guard. "If you can get to your roof, wave a towel. Leave a marking on the roof so helicopter crews can see you," he said, describing the volume of emergency calls as "staggering." Harvey hit Texas on Friday as a Category Four hurricane, tearing down homes and businesses on the Gulf Coast before dumping an "unprecedented" nine trillion gallons of rainfall inland. The Texas bayou and coastal prairie rapidly flooded, but the region's sprawling cities -- where drainage is slower -- were worst hit. Highways were swamped and street after street of residential areas was rapidly rendered uninhabitable, with power lines cut and dams overflowing. 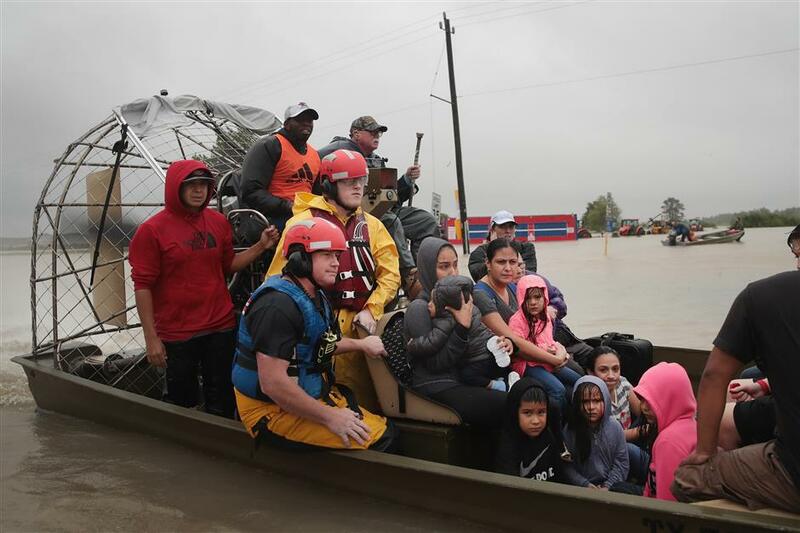 The US Army Corps of Engineers began to open the Addicks and Barker dams -- under pressure from what the agency has dubbed a "thousand-year flood event" -- to prevent a catastrophe on the outskirts of Houston. Latitia Rodriguez was rescued along with her husband, children and grandchildren by the Williamson County police department, negotiating the flooded Route 90 in boats. "We have to evacuate. We have too many kids. So we had to save our babies," she told AFP. "There's a lot of people over there. We would like to help everybody but we can't. We have our own kids." Meanwhile, the disaster is far from over: Harvey has turned back on itself and is hovering on the Gulf Coast, sucking up more rain and threatening a new landfall on Wednesday. And after the storm will come clean-up and recovery. "We actually anticipate that as many as a half a million people in Texas will be eligible for and applying for financial disaster assistance," Vice President Mike Pence told KHOU Radio in Houston. "We know it's far from over." Trump -- facing the first major natural disaster of his presidency -- has also declared a state of emergency in neighboring Louisiana, next in line for a downpour. 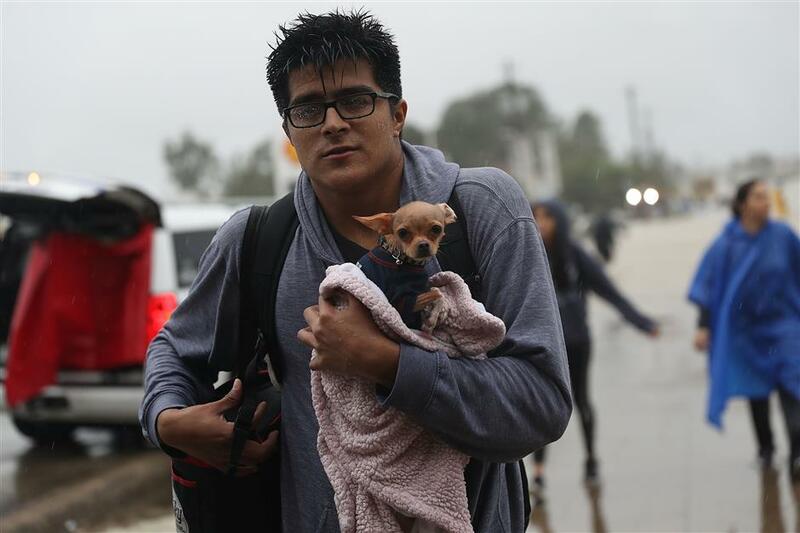 Evacuees make their way to dry land after leaving their homes that were inundated with flooding from Hurricane Harvey on August 28, 2017 in Houston, Texas. Rescue efforts on the outskirts of town appeared to be disjointed. In Williamstown County, a police boat sitting on a flooded highway on Route 90 tried to rescue people but had nowhere to take them because no emergency vehicles could come get them at a dropoff location. Roughly 50 people needed rescuing, 12 of whom had non-life-threatening medical conditions. Rescuers had to leave them there despite multiple requests for emergency vehicles that never came. Many people living in smaller communities by the coast were also driven from their homes. Robert Frazier, a 54-year-old foreman mechanic, left his home in La Porte, south of Houston, with his wife Judy on Sunday and made it as far as a motel on the road towards Louisiana still in Harvey's path. "We're trapped," Frazier said, speaking to AFP after he had tried to return home for some of his abandoned possessions, but finding the highway cut. "I haven't been through nothing like this." The National Weather Service said that between June 1 and Sunday, Houston had received 46 inches (117 centimeters) of rain -- almost as much as it would expect in a year. "The breadth and intensity of this rainfall are beyond anything experienced before," it said.